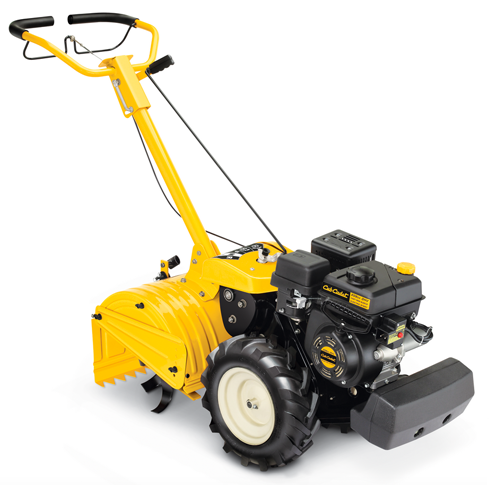 Thanks to the Cub Cadet garden tiller XC3, the strenuous and time-consuming work of digging and loosening the soil by spade is a thing of the past. Powerful and reliable, the tiller tackles any job – it breaks up even hard soil and facilitates seed preparation. It is ideal for areas of up to 1000 m². Four self-sharpening, heat-treated, high-quality tine sets made of spring steel ensure excellent work results at a tilling width of 46 cm. The adjustable depth bar gives the machine better stability and allows the working speed and tilling depth to be controlled. The tiller has a forward and a reverse gear and is easy to maneuver. Acceleration, transmission and working direction can be controlled from the operator’s position. The handle which is freely adjustable makes using the machine safe, comfortable and easy on your back. Single-hand operation allows you to avoid footprints in areas already worked on. Fully covered tine set with 46 cm working width. The self-sharpening tines (330mm dia) rotate forward for milling and backward for deep digging. They produce a fine crumbled bed in any soil. Extra-wide 46 cm tilling width gives you more tilling area per pass – helping you cover more ground at a time.